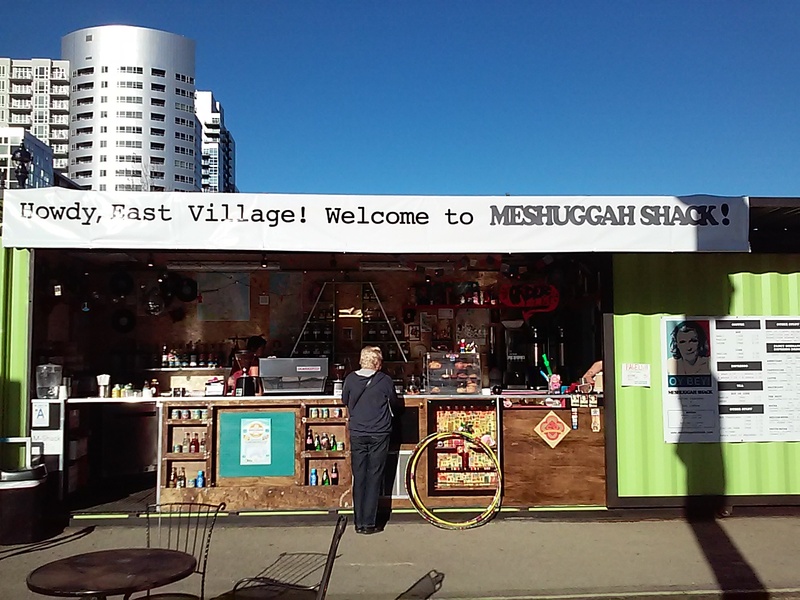 Welcome to the new East Village Meshuggah Shack! We’ve always liked the Meshuggah Shack in Mission Hills and we’ve been waiting for this newest location. We were curious to know what a coffee shop built from a container would be like. Well, wait no more! It’s here and the place buzzes with activity. This newest Meshuggah Shack is constructed from a green banana container and located in the new Quartyard at Market & Park Blvd. in East Village. It faces east and gets the morning sun. We had bright sunshine the morning we were there so be sure to wear a hat, sunscreen, and grab your sunglasses. I love morning sunshine with my cup of coffee. That said, it was so bright and sunny we opted for delicious iced coffees on our outing. 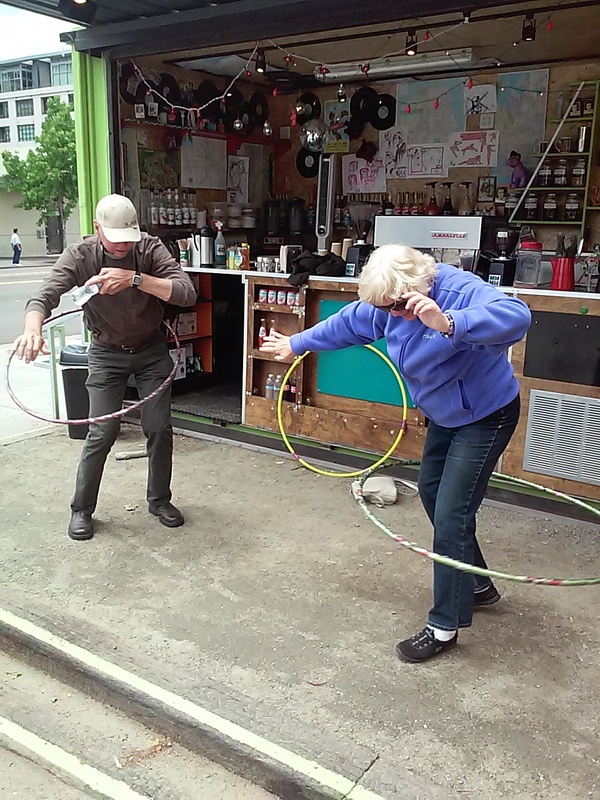 Where else can you enjoy great coffee and hula hoop? Meshuggah Shack doesn’t have a door. Instead it is wide open along the length of the container. There are numerous visual smiles as you spot their quirky decorative touches, like hula hoops for their customers to use. Their menu is worth reading, even if you only want coffee, with its interesting offerings of Chiquita Carmen Nagila, Our Lady of Malibu, or East Village Hippie Chick. If you are in the area, be sure to stop by this location. Based on our visit, it looks like it has already become a go-to coffee spot. Check out the other vendors & events at Quartyard: http://www.quartyardsd.com/home. The trolley is close and the downtown library is just blocks away. Parking can be a problem in this downtown area and it has been made more complicated with construction projects. There is some metered parking, but if you scout around you might find some free parking. Like all downtown parking areas, be sure to read signage carefully. There are also parking lots nearby. 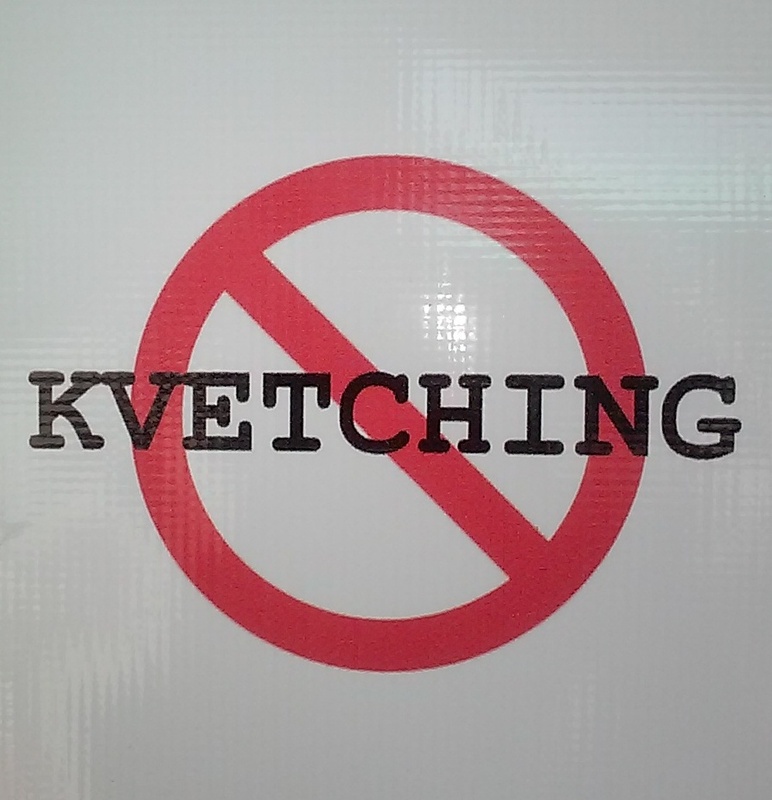 But remember, no kvetching, or complaining, if you have to pay for parking! A sign at the first Meshuggah Shack in Mission Hills. This entry was posted in downtown San Diego and tagged downtown San Diego, East Village, Quartyard. Bookmark the permalink.